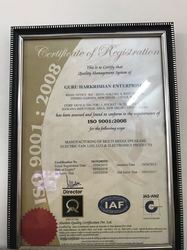 Guru Harkrishan Enterprises Delhi (India), established in 1995, based business entity, is acknowledged for providing high quality speakers, home theater. The company is primarily engaged in the manufacturing, supplying, exporting and importing of high quality speakers and home theater of different sizes and specifications. We export Globally. 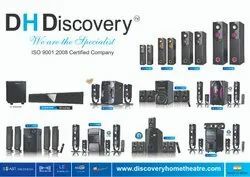 The electronic goods offered by us, are marketed under brand name “DISCOVERY” that reflects the genuineness of the products and our credibility. Adopting ethical business practices, we have ascertained huge clientele in the regions of India. We have satisfied our clients by catering to their exact expectations. We never compromise on quality and we believe in innovation and style because these are our prime concerns. High quality raw material from our selected vendors. Have a dedicated workforce which is well trained and qualified. Advanced manufacturing and testing facilities. We have highly quality vendors even to suit your adaptive needs. State of the art machines & equipments to provide the best quality. Process which are result of intensive research & development. The quality of our organization which makes us strives for continuous improvement in every sphere of our activities. We want to become your business partner and an advisor, so do not hesitate to get in touch regarding any questions that you have. For more information please address our managers using contact information, we will be happy to attend to any of your enquiries. Manufacturing, Trading, Importer AND Exporter of Multimedia Speakers. The satisfaction of our clients is of utmost importance to us. In order to ensure the same, we have been engaged in offering premium quality products at affordable costs. Professional quality auditors have been roped in to inspect the quality of each outgoing product. Fair and ethical business dealings ensure that clients are always happy with our products and services. We deliver products in highly efficient manner within the specified time-period. Further, our products are reasonably priced and easily accessible for everyone.